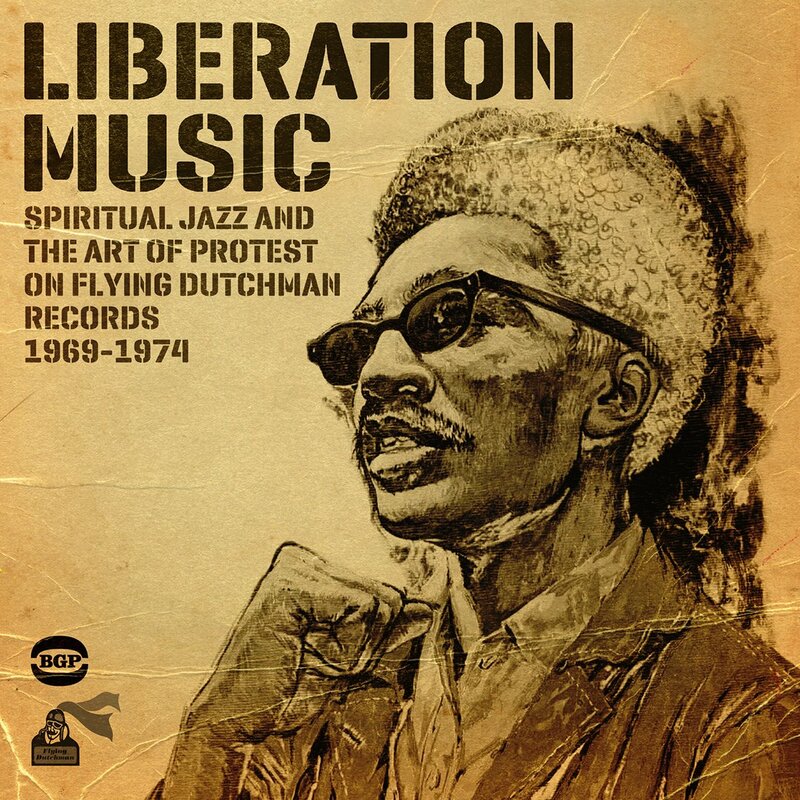 LIBERATION MUSIC-THE SPIRITUAL JAZZ AND THE ART OF PROTEST ON FLYING DUTCHMAN RECORDS 1969-1974. Looking back at the roster of artists Flying Dutchman Records amassed during the first five years of its existence, can’t help but be impressed. After all, between 1969 and 1974, Flying Dutchman Records couldn’t just boast true jazz legends, but pioneers of jazz music. Obviously, Flying Dutchman Records is best known for Gil Scott-Heron and seminal releases like The Revolution Won’t Be Televised and The Bottle. However, as BGP Records’ recent release Liberation Music-The Spiritual Jazz and The Art of Protest On Flying Dutchman Records 1969-1974 demonstrates, there’s much more to Flying Dutchman Records that Gil Scott-Heron. Artists like Leon Thomas, Ornette Coleman, Chico Hamilton, Louis Armstrong and Lonnie Liston Smith and The Cosmic Echoes. As you’ll realize, the sixteen tracks on Liberation Music-The Spiritual Jazz and The Art of Protest On Flying Dutchman Records 1969-1974 are the perfect primer for newcomers to Flying Dutchman Records. To whet your appetite I’ll pick some of the many highlights of Liberation Music-The Spiritual Jazz and The Art of Protest On Flying Dutchman Records 1969-1974. Flying Dutchman Records was founded by Bob Thiele in New York in 1969. Initially, Bob’s new label was known as Flying Dutchman Productions. Bob Thiele was a veteran of the music industry, who previously, had been a producer, songwriter and music industry executive. Given his experience, he was perfectly placed to run his own label, which he named Flying Dutchman Records. Initially, Flying Dutchman’s releases were distributed by Atco. However, withing two years, Mainstream Records, owned by Bob Shad took over distribution. One of Bob’s biggest coup’s was signing the five album Flying Dutchman series in 1972. His other triumph was signing Gil Scott-Heron, whose best described as an author, poet, musician, soul singer and spoken word performer. Usually, when Flying Dutchman crops up in conversations, it’s Gil’s trio of albums 1970s Small Talk At 125th and Lenox, 1971s Pieces Of A Man and 1972s Free Will. Along with Leon Thomas, Ornette Coleman, Chico Hamilton, Lonnie Liston Smith and The Cosmic Echoes and Gato Barbieri, Bob Thiele built up Flying Dutchman’s roster to include an enviable roster of jazz pioneers and innovators before RCA Victor took over Flying Dutchman Records in 1976. However, Flying Dutchman Records’ critically acclaimed period was between 1969 and 1974. That’s the period Liberation Music-The Spiritual Jazz and The Art of Protest On Flying Dutchman Records 1969-1974 covers. For me, this is when Flying Dutchman were at the their zenith as pioneers and innovators. You’ll realize that when I tell you about the highlights of Liberation Music-The Spiritual Jazz and The Art of Protest On Flying Dutchman Records 1969-1974. Seminal. That’s the only way to describe Gil Scott-Heron’s The Revolution Won’t Be Televised this three minute career defining classic. It features on Gil’s 1970 debut album Small Talk At 125th and Lenox. Produced by Bob Thiele, where Small Talk At 125th and Lenox was recorded is disputed. Some industry insiders claim it was recorded in the studio with a small “invited audience,” others claim it was recorded at a nightclub on the corner of Small Talk At 125th and Lenox. Regardless of where Small Talk At 125th and Lenox was recorded, it’s a classic album and one of the best albums Flying Dutchman ever released. Sais (Egypt) is a track from Lonnie Liston Smith and The Cosmic Echoes’ 1974 album Cosmic Funk. This was the second of five albums Lonnie Liston Smith and The Cosmic Echoes released on Flying Dutchman between 1973 and 1976. His sixth and final album Renaissance was released on RCA Victor, who took-over Flying Dutchman. Each of these six albums, are introduction to one of jazz music’s true pioneers. Lonnie’s music seemed to be in a state of constant state of evolution and Cosmic Funk is best described as, a melting pot of jazz-funk and space-age jazz. Later albums, veers in the direction of free jazz. However, Lonnie’s 1973 debut Astral Traveling, 1974s Cosmic Funk and 1975s Expansions are the real high-points of his career. I first came across Louis Armstrong’s 1970 album Louis Armstrong and His Friends over thirty years ago. I’d bought a bargain bundle of vinyl and sitting in the back of the box was a mint copy of Louis Armstrong and His Friends. Featuring a mixture of protest songs like We Shall Overcome and Give Peace A Chance, plus classics like Mood Indigo and What A Wonderful World. Good as the first four tracks on SIde One of Louis Armstrong and His Friends were, The Creator Has A Masterplan, which featured Louis Armstrong and Leon Thomas, proved to be a game-changer. Written by Pharaoh Sanders and Leon Thomas, who adds guest vocals, the result is spine-tingling, emotive and beautiful piece of music. For anyone whose yet to discover Louis Armstrong and His Friends, it’s an album well worth discovering. The Creator Has A Masterplan is proof of this. Earlier, I mentioned how Bob Thiele signed numerous jazz legends and pioneers to Flying Dutchman Records, Ornette Coleman falls into both categories. Although best known as a jazz saxophonist, Ornette is a true multi-instrumentalist, equally at home on violin, trumpet and saxophone. He was an unmistakable and unique sound, one that can’t be replicated. Not only that, but Ornette Coleman was one of the inventors of free jazz. Friends and Neighbors is a track from Friends and Neighbors: Live At Prince Street, which was recorded on St. Valentine’s Day 1970. Despite not being released until 1972, the album still had and has a contemporary sound that looks to the future, not the past. One of the earliest albums Flying Dutchman released was Leon Thomas’ 1969 debut album Spirits Known and Unknown. This was the first of seven albums Leon released for Flying Dutchman Records. Avant garde is a fitting description of Leon’s music. Granted his singing style was conventional, Leon through the rule book away when he veered towards a yodeling style that’s totally unique and inimitable. Spirits Known and Unknown features the original version of The Creator Has A Masterplan and another of Leon’s best known tracks, Echoes which features one of jazz music’s best kept secrets at his best. Born in Rosario, Argentina, Gato Barbieri was at the height of his popularity during the free jazz era of the sixties and then Latin jazz era of the seventies. Between 1971 and 1973, he released four albums on Flying Dutchman Records. His Flying Dutchman debut was Fenix, which featured Tupac Amaru, which featured Joe Beck on electric guitar and Lonnie Liston Smith on piano and electric piano. For newcomers to one of jazz music’s pioneering tenor saxophonists, Fenix is the place to start. Martin Was A Man, A Real Man was a track from Oliver Nelson’s 1970 album Black, Brown and Beautiful, an album crammed full of eloquent social comment. Black, Brown and Beautiful marked Oliver’s third decade in music and was his only solo album for Flying Dutchman. The other Flying Dutchman studio albums Oliver featured on was 1970s 3 Shades of Blue which featured Johnny Hodges with Leon Thomas and Oliver Nelson. Good as 3 Shades of Blue is, Black, Brown and Beautiful is a truly powerful and innovative album, from Oliver Nelson jazz saxophonist extraordinaire and a veteran of labels like Verve, Impulse and Prestige. My final choice from Liberation Music-The Spiritual Jazz and The Art of Protest On Flying Dutchman Records 1969-1974 is Chico Hamilton’s Gonna Get Some Right Now. Just like Oliver Nelson, jazz drummer Chico Hamilton counted Impulse as one of his former labels. He only released one album for Flying Dutchman Records, 190w El Exigente-The Demanding One, which featured the flawless Gonna Get Some Right Now. Although Chico only released one album for Flying Dutchman Records, it was a minor classic. One listen demonstrates this. The sixteen tracks on Liberation Music-The Spiritual Jazz and The Art of Protest On Flying Dutchman Records 1969-1974 are the perfect primer for newcomers to a pioneering jazz label with a social conscience. Flying Dutchman Records wasn’t shy about protesting about life’s injustices. While other labels would’ve flinched at releasing albums by Gil Scott-Heron and Oliver Nelson, Flying Dutchman felt duty-bound to help right the wrongs their music railed against. So, in many ways, it was the perfect home for artists like Gil Scott-Heron, Leon Thomas, Ornette Coleman, Chico Hamilton, Oliver Nelson and Lonnie Liston Smith and The Cosmic Echoes. With what’s an eclectic selection of the familiar and lesser known tracks, Liberation Music-The Spiritual Jazz and The Art of Protest On Flying Dutchman Records 1969-1974 veteran jazz fans will welcome this reminder of what was, one of jazz’s real innovative labels. During the first five years of its existence between 1969 and 1974, Flying Dutchman Records released the most important, critically acclaimed and pioneering jazz music of that time. This is music that can be found on Liberation Music-The Spiritual Jazz and The Art of Protest On Flying Dutchman Records 1969-1974 and has stood the test of time. To use Gil Scott-Heron as an example, his music is equally relevant and socially important over forty years after its original release. That proves how far-sighted Bob Thiele was, when choosing the artists he signed to Flying Dutchman Records. Mavericks, pioneers and innovators all called Flying Dutchman Records home, as BGP Records’ recent compilation Liberation Music-The Spiritual Jazz and The Art of Protest On Flying Dutchman Records 1969-1974 proves. What’s more, Liberation Music-The Spiritual Jazz and The Art of Protest On Flying Dutchman Records 1969-1974 is the perfect starting point for a long and enjoyable musical journey through Flying Dutchman Records illustrious back-catalogue. Standout Tracks: Gil Scott-Heron The Revolution Won’t Be Televised, Lonnie Liston Smith and The Cosmic Echoes Sais (Egypt), Louis Armstrong and Leon Thomas The Creator Has A Masterplan and Leon Thomas Echoes. ← SALSOUL PRESENTS: DISCO DIVAS AND SOULFUL SISTA FLAVAS.